Assisting member centers with setting Da’wah goals and developing guidelines for activities that guide the Muslim community in the light of Qur’an and Sunnah is the foremost principal and the underlying goal of the council. Therefore, the council sets the general guidelines for the methods of effective Da’wah in North America. The council sets educational curriculum for Islamic Weekend Schools and provides general standards and benchmarks for these schools. The council also publishes unified curriculum for Qur’an memorization and Islamic studies. The education sub-committee of the council meets regularly and provides improvement measures for the existing curriculum. The council provides family counseling with extensive workshops and training for the center staff members to effectively serve the Muslim families when conflicts arise. This is an effort to reduce the recent trends of family problems stemming from changing roles and expectations of the two family members mainly spouses. Setting up general fatwa hotline for general inquiries about all aspects of the Islamic religion especially with inquiries that require further research and deep understanding of the Islamic jurisprudence. Creating new Islamic centers and mosques where significant numbers of the Somali community resides. Although, it is over fifteen years since the first wave of the Somali community arrived the North American continent, yet there are regions in the United States where large numbers of the community reside without enough mosques/centers. 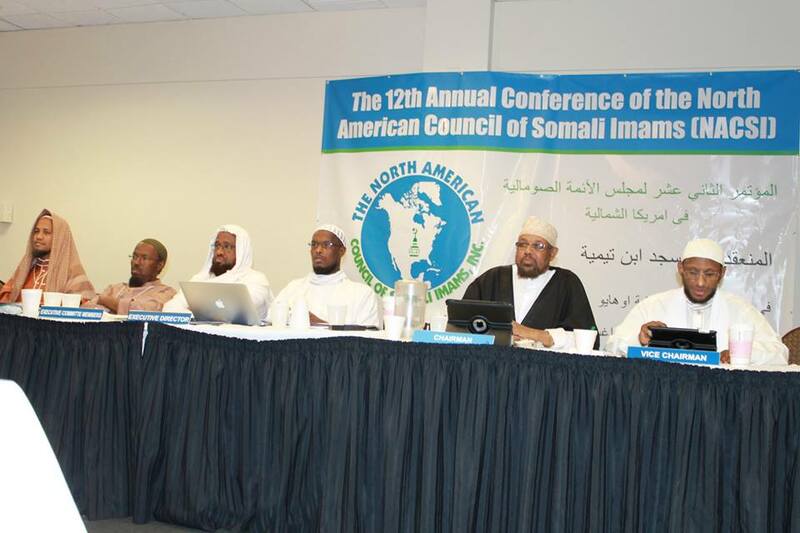 The council of North American Council of Somali Imams attends all national level meetings and conventions regarding the Muslim and Somali communities in America. Announcing general Islamic holidays such as Eid-ul-adha, Eid-ul-fitr and the sighting of the moon for both the beginning and the ending of the Holy month of Ramadan. All the member mosques/centers communicate with council for a unified timing of these Islamic holidays. Organize and execute annual Islamic conferences. The Muslim community in North America is in dire need for enlightenment and intellectual growth which contribute preserving its Islamic identity and heritage. In an effort to meet that need, the North American Council of Somali Imams organizes annual Islamic Conferences that attract thousands of Muslims across the United States. These conferences function as the main get together of the Muslim and Somali Communities of North America. The most popular and highly attended conference is held in Minneapolis, Minnesota which attracts more than five thousand attendees every year. the Council arranges and assists with fundraising activities for the centers. Due to the late arrival of the Somali Muslim community to America, most of the communities have been in the early stage of establishing mosques and centers, and facilitating and assisting with these fundraising activities is the main services provided by the council. Up to date, more than half of the current members of the council own the buildings they are house in with combined assets of millions of dollars. Every year, the council decides what mosques/centers will be given the permission to hold fundraisings throughout the member centers with prioritization based on need and urgency. The council also appoints professional and well respected fundraisers to assist with the fundraising activities from among the member mosques/Centers.